Last summer I found a package of 10" square batik precut fabrics that I just had to have. I decided to make a quilt for my mother and give it to her for Christmas 2015. I found the perfect pattern on the Moda Bakeshop called Mountain Blossom by Emily Bailey. This would be my very first experience working with precut fabric. I remember the day I started it. My husband went out of town for business, and I later met up with him. During my down time at the hotel, I cut the fabrics and stitched them together, making a simple Nine Patch block. I later cut the blocks again into what is known as a Disappearing 9 Patch. Piecing the quilts goes by so much faster when you have the purr...fect helpers! Chai Kitty is SuPurrVising the make shift cutting station and MagiKat is the Pressing SuPurrVisor! Here's the quilt top all pieced together. I chose a simple solid white fabric for the alternate blocks. I used Sulky KK 2000 Temporary Spray Adhesive to baste the backing, batting and top together. I love KK 2000! I wanted to make sure there wasn't going to be any shifting, so I installed my walking foot and stitched in the ditch. Then I basted along the outer edge of the quilt. I had big dreams for this quilt. It had been a long time since I made a quilt, and I get so much personal satisfaction doing the whole process. I trying something new each time I make something. This time, my personal challenge was to quilt it with embroidery machine. As the clock ticked and Christmas was getting close, tragedy struck...a MAJOR unplanned set back. Zero blessed the quilt. Yep...he peed on it! Luckily I had the quilt draped across a table top, but he managed to get it. It's a good thing he's so darn cute. I love his crooked smile! I was a little perplexed because the precut fabric was not prewashed. I washed the unfinished quilt in cold water along with a couple Shout Color Catchers! Then I hung it to dry. I did not want this quilt to shrink on me. Still, afterwards it was such an eyesore to me because it was so wrinkled. NOTHING would take the wrinkles out. So, the quilt sat unfinished, and it was not finished in time for Christmas. That's all right, the apple doesn't fall far from the tree and my mom did not finish the gift she made for me in time for Christmas either. So we decided to exchange gifts when I visited in January. Then inspiration struck. I found the perfect machine embroidery CD. It had 42 different quilting motifs. 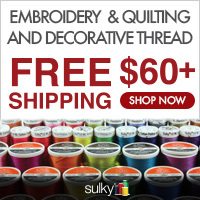 Being a National Educator for Sulky, let's just say I have just a little bit of Sulky thread in my stash. So, I knew I could easily embroider each quilting motif with a different 30 wt. Sulky Cotton Blendables thread. 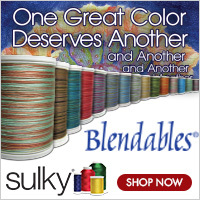 BTW...There are 126 different colors of Cotton Blendables thread. For the first time ever, I quilted all of the white blocks using my embroidery machine. It was so easy!! I was especially proud of myself when most of my alignments were spot on!!! If I could change just one thing about the design, it would be to increase the stitch length. But, each block was stunning! I was beyond the moon and back ecstatic with how beautiful this quilt turned out despite all of its trials, and my mom loved it too!!! My mother came to visit me in June 2016. I made up the guest room with her quilt on the bed, and she took it home with her. While she was here, she finished my gift. I'll share it with you another time! Until the next time...Sew Long! Disclaimer: I am an affiliate for Sulky. Please feel free to use the special links in this post and on my website to stock up on your favorite Sulky products. Thank you so much, I appreciate your support!